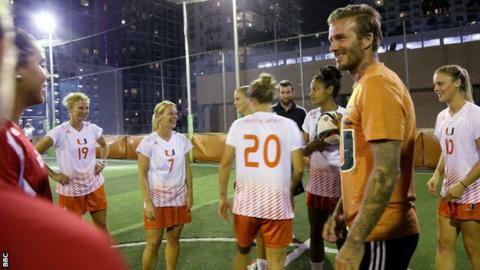 Major League Soccer will approve the David Beckham-backed Miami franchise "in the coming months". The announcement comes three years after the former England captain exercised an option in his LA Galaxy contract to own a franchise. Having won a court battle over the purchase of land for a 25,000-seater stadium, Beckham's group can proceed with becoming an MLS expansion team. The league is planning to increase the number of teams from 22 to 28. It added Minnesota United and Atlanta United in 2017 with Los Angeles FC set to join city-rivals Galaxy in 2018. There are also 12 groups competing for four more spots in the MLS. A decision on who two of the newcomers will be is expected in December. The MLS told the BBC it has not set a date when it will include the new Miami team in the league. MLS spokesperson Dan Courtemanche told BBC Sport: "We look forward to working with David, Todd Boehly [majority owner] and their partners to finalise their expansion plan. "David and his partners have committed a significant amount of time and resources to put everything in place to bring Miami the elite-level soccer team and stadium it richly deserves. "We expect to make an official announcement to launch a new Miami expansion club in the coming months." The other partners involved in the as-yet-unnamed team include former Spice Girls manager Simon Fuller, Bolivian-American businessman Marcelo Claure and sports executive Tim Leiweke.